This weekend ended on a high note last night when I got the chance to see Lizz Wright live in concert for a second time. I recall first hearing about her a few years ago when her first album, Salt was released. I saw her CD featured at one of the listening kiosks at Virgin Records in Times Square. Gave it a brief listen & decided at the time I wasn’t feeling the jazz vibe. It wasn’t until I started hearing rave reviews about her third album, The Orchard that I decided to give her another listen. I bought the CD and loved it so much I ended up also buying the previous two and enjoyed them as well. The first time I saw Lizz in concert was at the Town Hall, which despite it’s name is a theater. Her set was good, a mix of jazzy tunes with some folk songs. 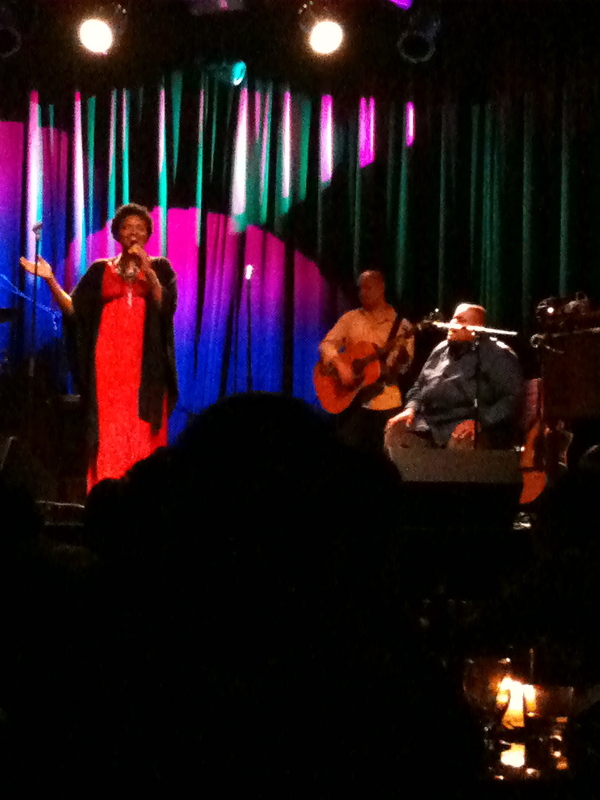 This time around she was appearing at Highline Ballroom, a much smaller and more intimate venue. Thank God the weather was not freezing, because the club had us waiting outside for almost 1/2 hour past opening time due to the band still having sound check. But it gave us just enough time for my friend Nicky to show up. Along with another friend Tammy, and Ketrina who joined us later, we got a table for 4 in the center of the club. After a light dinner of Kobe burgers & fries with the house version of a hurricane drink that to me was more sweet than alcoholic. I’m ready for the show. 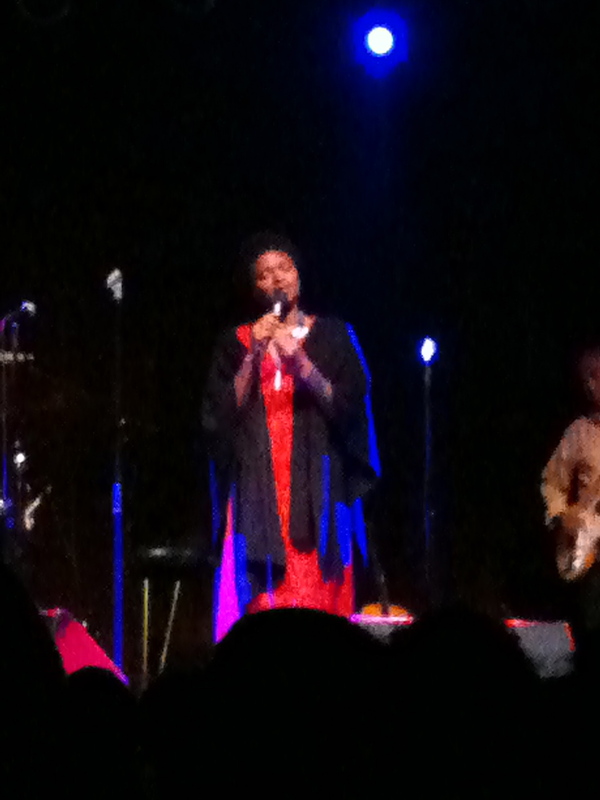 Lizz Wright appeared on stage with a bright red (it was Valentine’s Day weekend after all) dress with black shawl. Accompanying her for a couple of tracks was Toshi Reagon, the daughter of Bernice Johnson Reagon, founder of Sweet Honey In The Rock; and who is credited with producing several tracks from Lizz Wright’s latest CD, Fellowship, Lizz’s set this time was more gospel oriented, doing a number of tracks from Fellowship, as well as some of her popular tracks from her previous CDs. Her backup singers accompanied her for her gospel tracks that made the atmosphere reminiscent of a rural church (think of the church choir scenes from The Color Purple) Whether you preferred the jazz, folk or gospel tracks, there was a little something for everybody, the audience was fully entertained. A couple of folks looked like they were coming close to catching the holy ghost. By the end I was temporarily deaf from the whistling & loud music, but a great time was had. Only complaint I had was the bathrooms at Highline Ballroom need a complete design overhaul. Trying to use one of their ridiculously tight bathroom stalls was a workout. Previous Prince “Welcome to America” Live, NYC 2/7/11 Next On the needles….